The launch of the first 4G phone will improve VoIP solutions. When it goes on sale next month the HTC Evo 4G, or Supersonic, handset will be the first American handset to use the Sprint 4G network. It will allow high quality VoIP calls as well as increased data transfer. The phone hasa 4.3 inch TFT screen with a resolution of 480x800 pixels. The operating system will be the Android 2.1 and includes a Snapdragon processor running at 1GHz. The Supersonic will have 512 of RAM and 1GB of memory. It also has a camera and wi fi capability. 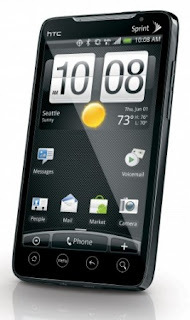 Sprint chief executive Dan Hesse said: "The HTC EVO 4G is a excellent 3G device and when you connect it to the growing 4G coverage area, it becomes a multimedia powerhouse." Pcworld.com recently did a test and found that the phone had a download speed of 13 Mbps. At this speed the 4G network can replace broadband at home as it has comparable download rates. When the HTC Evo is released, probably this summer, it will be in direct competition with the iPhone 4G. 0 Response to "New 4G phone to improve VoIP"